Yes, Durban is huge. And the beaches so long and beautiful. No idea which is the one I went to. But such a throng heading to it! And how I stood out among them! — Photo from Google. Scary, in fact. I lived through that New Year’s 13 years ago. And I’ve never experienced anything like it since. It was a unique experience. By the way, this account was published back then. I am posting it now because I think you’ll find it interesting and may learn something about prejudice from it. All my life, like you probably, I have celebrated New Year’s Day in winter—most often in a cold, icy, snowy winter. Not in a short-sleeves Florida or Arizona or southern California winter. Winter arrives on Dec. 21, of course, and New Year’s Day 11 days later, on January 1. My saying this seems silly, but I say it for a reason. Yes, seeing the New Year arrive has often meant stepping outside into freezing cold and then suffering in my frigid car tlil the engine begins blowing in hot air. For many decades this was too often the way I experienced New Year’s Day. With just one big exception.That was when I traveled around the world alone for five months. Four and a half months of it by myself—147 days, 20 countries, 36,750 miles by plane, train, and short legs by bus. And for only $83 per day, with everything included, right down to every snack and phone call and all the visas required. Visas can be expensive. That trip was my present to myself for my imminent 75th birthday. It was a grand adventure. More than that, an odyssey. It led to my book, “Around the World at 75. Alone, Dammit!” It’s a book still selling, and in fact, one that got to be published also in China in Chinese—well, Mandarin, which is the principal language. I crossed the Equator, a big deal for me. When you do that, the seasons are just the opposite from ours. If we’re in spring, down there it’s autumn, and if summer, winter. Then I crossed it again to return north, and same experience. Well, as New Year’s Day approached, I arrived in Durban, South Africa. That’s nearly as far south in Africa as you can go, and I had come a long way, all the way from Cairo in Egypt on the Mediterranean. I arrived in Durban on Dec. 28, just seven days after the start of winter and three days before the new year dawned. But it was summer there, with long daylight, short nights, shirtsleeve temperatures, even bathing suit temperatures. How remarkable. How wonderful. Durban is a big city. An impressive city. And I was there to enjoy it. I was staying in a nice hostel right downtown, the Banana Backpackers. I repeat. Not hotel. Hostel. I was using hostels because they were cheaper (hotels for five months can get expensive) and I got an experience more true to my purpose. Don’t ask me why that name, Banana Backpackers. I never found out. And I was making friends. And I was making the most of the city, taking in everything I could—its bustling downtown, its historic and tourist attractions, its museums. It’s all in my book. New Year’s Day was a great celebration there, too. It’s a big day all over the world. I read everything I could in the big Durban daily about activities coming up. English is the official language. There would be all the usual merry-making. I was looking forward to it. Planned to enjoy it as much as I could. New Year’s Day rose, bright and sunny and warm and beautiful. But none of my senses told me that this was New Year’s Day. This was so dramatically different. But my brain did. Durban is right on the Indian Ocean, just north of where the Indian and Atlantic Oceans merge below Cape town. Durban has great beaches. I had not glimpsed them yet, but I knew they were gorgeous. I intended to get to them today. They were not far, at the end of a broad avenue that nosed right into them. A cinch. I could get to them in just a few blocks. But imagine my surprise. My stupefaction. Thousands of people were planning to do the same thing. I noticed that the minute I stepped out of Banana Backpackers. People jammed the boulevard, walking in from various directions. So many. Amazing. The boulevard was closed to vehicles for the day. People were heading south on it in a broad torrent. They crowded the whole width of the street. All going the same way, toward the salt water. Some on bikes but most hoofing it. Carrying all the usual stuff—towels, picnic baskets, folding chairs, parasols, toys. Many with children in hand. Instantly I saw they were all black! 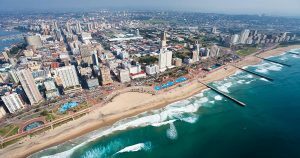 Durban is a typical South African city. It has the usual mix of blacks and whites, but the blacks were there first and predominate. In fact, apartheid had been the law of the land until quite recently. Apartheid mandated the enforced separation of the races, the same as in many places in our U.S.A. when I was young, but even more severely in South Africa, I had read. I could not see any whites! Of course, white people like nice, warm, sunny beaches, too. Why this river of people was all black, no idea. I speculated. Sure, apartheid had finally been outlawed. But habits die hard. Black people traditionally went to the beach this way. White people took another routet o a different beach. That’s the way it was and the tradition lived on. No way could I walk with these blacks! I should drop out. That was my first thought. I gulped hard. I was so disappointed. But then I braced up. A main reason for this big and crazy adventure of mine–I knew some people thought it was crazy–was to visit other countries, and the more different the better. I wanted to see what they were really like. I was deliberately staying clear of the heavy tourist areas. I wanted to see the real people in their real everyday life. So how could I chicken out now? Uptight I was, but I stepped forward and slipped in among the blacks. Back home in Connecticut, blacks were quite few. I saw dark eyes studying me but I looked straight ahead and walked on. I was uncomfortable. Nervous. Apprehensive. I admit it and am embarrassed to say so. Though what I was doing was no longer illegal. I was tempted to drop out and head back to Banana Backpackers. What I was experiencing, of course, was plain, classic culture shock. I never considered myself prejudiced and was proud of that, but I was reacting prejudiced. My head was battling with my emotions. My head was telling me that 99 percent of these people were good, fine, no-problem people. I knew that this was true of people all over the world. Yellow, brown, red, black, white, mixed. In every country the bad ones—the malicious ones—are a tiny minority. True, too, in our U.S.A. The only thing these folks had in mind was getting to the beach for a fine New Year’s outing. My heart made me fearful, insecure, borderline panicky. But I walked on. I was feeling this way because they were so many and they were all black and I wasn’t used to this and there was no other white person around. But on I went. I wasn’t going to the beach to sun myself or swim. I did like these things back home. I was going because I wanted to see the Indian Ocean and smell the sea air and be part of the fun and observe everything going on and get some exercise and see what a New Year’s Day was like in this country and how folks enjoyed it. We got to the beach. A great big, broad stretch of sand. The Indian Ocean stretched out ahead, clear to the horizon, with not even a tiny island in sight. A few pleasure boats, yes. But know what? The Indian Ocean didn’t look a bit different than many other expanses of salt water I have gotten to see. The only reason I knew that this was the Indian Ocean was because my map told me it was, period. What I noticed was the great numbers of people. Right away I thought of Coney Island. Who isn’t familiar with Coney Island? I’ve never been to Coney Island. But I’ve seen the photos of the packed crowds on the Fourth of July. For sure this huge turn-out would rival Coney Island in the Guinness Book of World Records. And of course all these people were black. But they were behaving just like white people would. I became more relaxed. I began walking around. I roamed the beach. I made my way between all these people. Families in tight clusters. Kids frolicking and romping and tossing balls. Couples making out. People reading, snacking, applying suntan lotion, snoozing. I attracted a lot of looks. Plenty of stares. But not a single person took a step toward me. Maybe my age was a factor. I was an old man, so considered harmless perhaps. Anyway, I relaxed a bit. Not easy to walk in that loose sand. I made my way down close to the beach and walked along the shore on the packed sand, moist from the outgoing tide. Some people were in the water, swimming, splashing, floating, but quite few. Which is typical at any beach anywhere. I walked a long way to the left, then a long way back and to the right. All along, people looked me over. Many followed me with their eyes. Most people were too busy. I had my camera and I began sneaking pictures. I learned long ago it was not smart at times to face whoever I wanted to photograph and snap a picture. I had developed a different way. I would spot someone I wanted to focus on. Then I would turn 90 degrees and face in this new direction. While looking in this direction, slowly I would turn my camera back 90 degrees. Very stealthily. Yes, all while gazing straight ahead. And click the shutter. Sometimes I missed the shot. But often I got the good candid shot I hoped for. Rarely did anybody catch on. Now I got bolder. I even walked up to some people. Made sure I smiled. And asked if I could take their picture. Nobody said no. It was all pleasant. I was happy to be part of this. But this was a film camera. And of course my roll of film got used up. In all this, I did not come upon another white person. With apartheid dead, I was surprised some whites had not begin coming to this beach. Then I thought, would there be blacks at the white beach now? I didn’t get to find out. I quit long before the others did. I was happy I had not caved in to my apprehensions and had had what turned out to be a pleasant experience, in fact memorable. Back at the hostel, I found practically nobody around. That evening I ran into a couple of people and mentioned my visit down to the black beach and what I experienced there. Well, a wee bit of it. . But they were foreign tourists, too. Whites like me. They were interested. But they had few comments to make. Later I had another thought. It was about black people in the U.S.A. Black men and women of all ages born there and grown up there. Like me. Just as much an American citizen as I. And I thought of the many times when for sure they must find themselves alone among whites. Must feel as awkward and isolated and apprehensive as I felt on this New Year’s Day. Probably a common experience for them in my neck of Connecticut, where blacks are still a small minority, although the situation is changing a bit. I suppose they get used to it, adapt to it, and develop a certain comfort. Just as I did in South Africa. I felt these disturbing emotions just for a few hours on just one day. Some of our blacks back home must feel it frequently, in fact day in and day out, all their lives. How awful. That New Year’s Day in Durban made me more understanding. More sympathetic. I learned a powerful lesson. And the lesson has stuck. We’re all much alike. Little reason to be nervous among strangers. I haven’t had a weird one since then. Hope I never will. I’d like to include some of the photos I took that day but they’re not at hand. Sorry. Happy New Year to you, one and all, wherever you are! Please leave a comment. Your comments are my only payback. I read them all, good and not so good. Just email it to me at johnguylaplante@gmail.com. I’d appreciate that!